News, announcements, remarks and correspondence from the office of Chancellor Gary L. Miller. 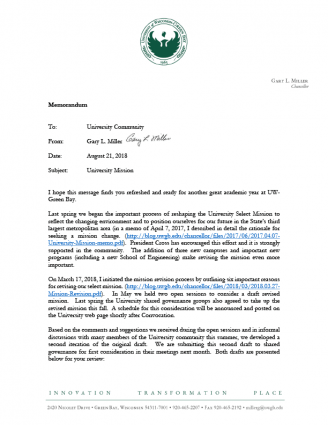 The UW-Green Bay Office of the Chancellor emailed the following memorandum on Tuesday, August 21, 2018 notifying faculty and staff from all campuses of a draft of the University’s select mission. The draft is to be submitted to shared governance for first consideration in their meetings next month.